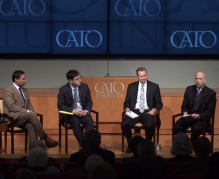 Featuring the author Philip Klein, Commentary Editor, Washington Examiner; with comments by Avik Roy, Senior Fellow, Manhattan Institution; Jeffrey H. Anderson, Executive Director, The 2017 Project; and Michael F. Cannon, Director of Health Policy Studies, Cato Institute. Taxes and Health Care: How Far How Fast? To get to repeal, conservatives should advance an alternative to Obamacare that revitalizes the individual market—which the federal government long ago broke—without disrupting the typical American’s employer-based plan. Jeff Anderson, Michael Cannon, and Avik Roy debate the importance of repealing Obamacare, the merits of various alternatives, and the actions that Congress should or shouldn’t undertake if the Supreme Court rebukes the Obama administration in King v. Burwell.